Actor Tim Holt started his career in early westerns for RKO Pictures and other studios during the 1930 and 1940s. He later appeared in the Orson Welles film The Magnificent Ambersons and The Treasure of the Sierra Madre with film legend Humphrey Bogart. Holt’s acting career continued in movies and television until his final appearance in 1971. From 1938 to 1955, Tim Holt was featured in a long-running series of western comics. 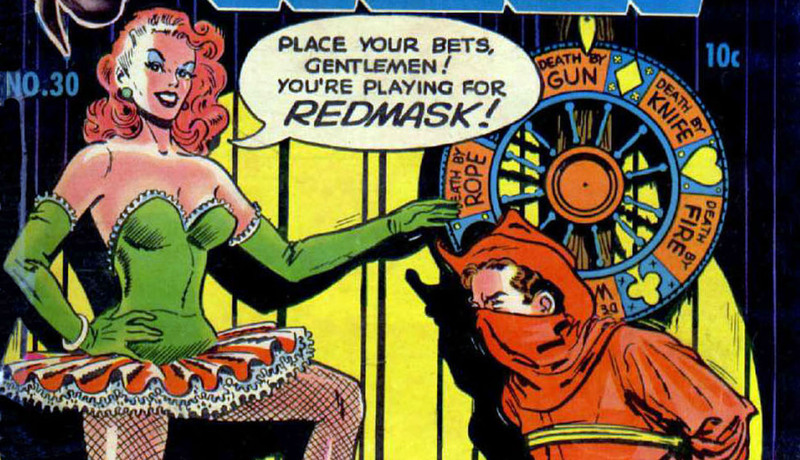 Holt’s character “Red Mask” played the hero in many adventures as he saved the innocent and delivered his own brand of justice to various villains and enemies. The June-July 1952 issue featured a villainess known as “Lady Doom.” In this story, Holt is captured and bound as Lady Doom chooses his fate from a spinning “Death Wheel” listing several methods of death, including water, fire, rope, gun and knife. Was the Zodiac inspired by this comic book? The Zodiac may have been inspired by other aspects of pop culture, including an episode of the classic television series Alfred Hitchcock Presents.